The subject of today's Tarot Blog Hop is Tarot and magical images associated with the first three decans of Aries (the start of spring supposedly in the Northern Hemisphere--looking out the window I can't tell that it is spring because the plains of Colorado are under a fire ban and it is a whole cool eighty degrees out there--it looks more like summer drought time than what spring is supposed to look like). Magical images are emblems used in both fortune telling and practical magic--the Tarot itself can be thought of as a set of magical images. First image of Aries: “The first face of Aries is Mars, and there rises in it according to the opinion of the great sages in this science, the image of a black man, with a large and restless body, having red eyes and with an axe in his hand, girded in white cloth, and there is a great value in his face. This is a face of strength, high rank and wealth without shame. This is its form.” This image corresponds to the first ten degrees of Aries (sub-ruled by Mars) and the Two of Wands (a man looking out onto the world from the walls of a high castle--will of creation "dominion"). The image from the Picatrix is used for invoking strength, high rank and wealth without shame. Second image of Aries: “There ascends in the second face of Aries a woman dressed in green clothes, lacking one leg. This is a face of high rank, nobility, wealth and rulership. This is its form.” This image corresponds to the second ten degrees of Aries (sub-ruled by the Sun) and the Three of Wands (a man looking out onto a harbor--supervising one's business "established strength"). The image from the Picatrix is used for acquiring high rank, nobility, wealth and rulership. Third image of Aries: “There rises in the third face of Aries, a restless man, holding in his hands a gold bracelet, wearing red clothing, who wishes to do good, but is not able to do it. This is a face of subtlety and subtle mastery and new things and instruments and similar things. This is its form.” This image corresponds to the last ten degrees of Aries (sub-ruled by Venus) and the Four of Wands (a couple under a wedding canopy--celebration and marriage "perfected work"). The image from the Picatrix is used to achieve subtlety, subtle mastery, and in the creation of subtle instruments and devices. And if you are anything like me, most of what was just said is just noise without much information context. 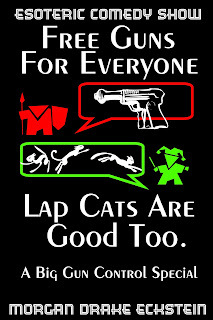 (Like for instance, what does "lacking a leg" in the second image mean? Does she only have one leg? If so, was she born without it? or did she lose it to some accident or disease? Or does "lacking a leg" mean that only one of her legs is visible and the other is hid from view by her clothes?) I have some idea how to use the magical images, thanks to my lodge and coven training, plus years of magical experimentation, but am I even remotely using them in a manner that the Arabic compiler of the Picatrix would have recognized? Now to be perfectly honest, the Tarot and the Picatrix magical images are not my go-to set for invoking the energies of this time of year. I tend to think of the wheel of the year more in terms of the eight Wiccan Sabbats...because I have spent my entire life in Wicca (seriously, before the age of ten, my sole religious education came from my Wiccan aunt because my parents could not decide what branch of Christianity [or Judaism] I should be schooled in--their indecision helped make me a witch). Sure, I can think in astrological and Tarot terms; but when it comes to magic, I am more of a Wiccan Sabbat person. As someone who thinks more in the terms of Wiccan Sabbats, occasionally I find myself needing to do spell-work that matches a Wiccan Sabbat, but being months and months away from the Sabbat that best fits my need. The first time this happened was over a decade ago--I needed to do something that matched the ideas and energies of Beltane--and I was nowhere near Beltane at the time (the next Wiccan holiday was Yule which is hardly spring-like). By this time, I had already become an initiate of both Wicca and an offshoot of the magical tradition known popularly as the Hermetic Golden Dawn, as well as having read and dabbled in various other magical traditions, including the grimoires. Therefore, I choose the idea of using magical images to address my little timing problem. My set of magical images grew out of the symbolism of the Wiccan Sabbats, due to the fact that the spell-work I was doing corresponded in my mind to one of them. At first, my set of magical images grew piecemeal as I needed to use new ones. It wasn't until a few years ago that I completed the whole set (the first time, I showed the full set to anyone was at a Open Full Moon ritual where I did a ritual tour of the Sabbats--if you are really interested in the ritual and the whole set, there is the little ebook [e-article] up on Amazon [and other ebook outlets]). So what does the magical image that I am using for this time of year look like? 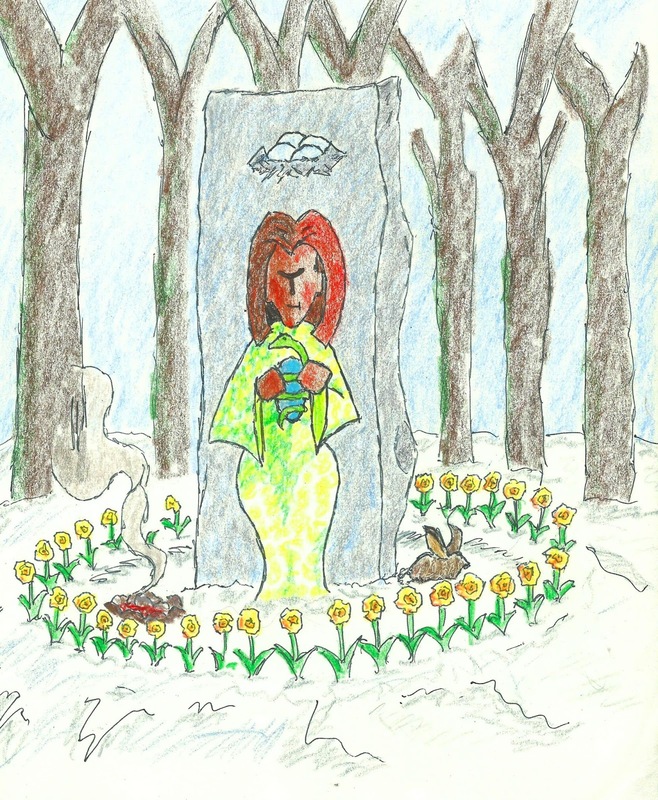 In front of the standing stone marked with a sigil of a nest of eggs stands the magical image of Ostara. Beside a fire of dying embers, a woman stands, surrounded by a circle of daffodils. In her hands, she holds an egg with a snake coiled about it. 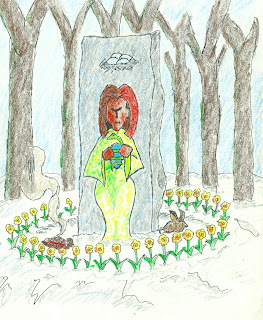 The magical image of Ostara (Spring Equinox) as conceived by me. And I created a little speech for this magical image that helps describe the meaning of the Sabbat. Listen to the words of the magical image of Ostara: Robin call, bear cubs, tender shoots, the sun is reborn. Light and dark are equal; the elements are in balance, yet scarcity remains. Eggs laid, planted seeds, and cherry trees in bloom; all is caught between hope and fear. Will it stay warm? Will it rain enough? Will hardship stay away? Only time will tell; one can only prepare and hope. The cycle of hours, the cycle of days, the cycle of years, it all spins around and around. This is the time of newborn hope; this is the time of new beginnings; the ground prepared, and the seeds planted. Look forward; plan ahead; hope for the best—celebrate the equinox of spring, the most hopeful time, as the wheel of the seasons turns and turns. So that is the magical image I use for invoking the energy of this Sabbat. I love your art, Morgan, and I love your concept of the circle of magical flowers which exists in so many images and ideas. Well done, and thank you!! Boy, I could sure use a little spring. In Sault Ste. Marie, Ontario (just along the border with Sault Ste. Marie, Michigan), we're still getting snow. Today is quite warm at 7 C, but it'll be -4 C again by Saturday. Le sigh. I find it very difficult to think invigorating thoughts when the outdoor aesthetic matches Disney's Frozen for almost six months out of the year. There's a Wiccan circle up here that I meet up with once in a while for potlucks, and they've often lamented that the wheel of the year is totally broken for this far north. For example, Imbolc is supposed to be a holiday which marks the first hints of spring, but for us it's the deepest portion of winter and we can't be certain that we're done with the snow until the first week of April. This Wiccan circle was talking for a while about making a sort of bio/regional tradition which marks this fact of life, but nothing much ever came of it. 'drawing' in the energy of the season...literally! Thank you for making this doorway for us. James--one of my teachers pointed out that the Wheel of the Year was cobbled together from the festival calendars of several cultures, and that no culture actually practiced all eight of the Sabbats. Therefore, the Wheel as we have it is actually artificial. Coming up with (adjusting) a new Wheel is damn hard work. Oh, yeah - I believe, Morgan. That's probably why it ultimately fizzled out. So much to put together! James--another thing to bear in mind is that many of the holidays that our Wheel is based on were movable holidays--they were celebrated in connection with the action of the holiday (Ex. a planting holiday occurs naturally with your first planting)--and that several holidays overlap in function (for instance, there are three harvest holidays in the Wheel). I do love your calendar and energy need flexibility letting you find the best way to work with your magicks. Also love the daffodils in your pic; they are prominent in the human-cultivated bits of the landscape here in Oregon, where it is still quite damp, but not frigid.